Vermont advocates involved in the state's push to require labels on food products if ingredients were genetically engineered in a lab say a bill that passed through Congress will do a disservice to consumers who want to know what they're eating. "I'm outraged," said Andrea Stander of the Vermont Right to Know Coalition. "And I think everyone in this country should be outraged." Vermont enacted its labeling law July 1. Many food products contain genetically-modified organisms, or GMOs, because using them can improve crop yield or manufacturing efficiency. 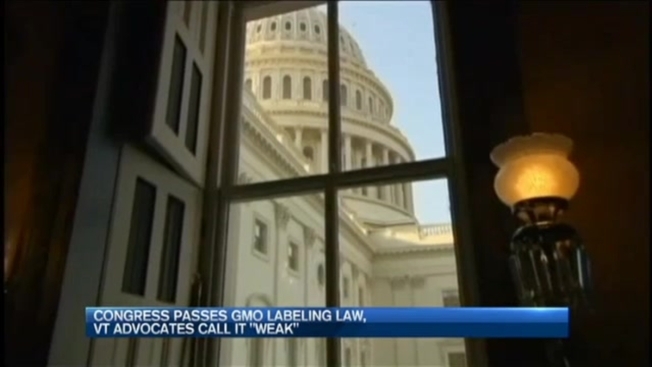 A bill passed in the U.S. House Thursday would preempt Vermont's state law requiring labels on items made with GMOs. The federal bill calls for a national labeling requirement, though those labels could be either text, a symbol, or an electronic code only smartphones can decipher. "Just tell us," Stander said, describing her desire to see clear labels on food packages. The federal legislation would be weaker and less transparent than the plain-English requirement in Vermont, advocates like Stander argue. Plus, the labels could be two years away, with federal agriculture officials writing rules for the launch. Republicans and lawmakers from rural states overwhelmingly supported the legislation, which passed the House on a 306-117 vote. Agriculture groups have backed it, hoping it will bring more certainty to farmers who grow genetically modified corn and soybeans. The Food and Drug Administration has said GMOs are safe to eat. Still, many consumers question possible environmental effects. "Sometimes there's no choice, but at least I want to have that option," said Montpelier grocery shopper Andrew Nyquist, describing how he's willing to buy an item containing GMOs, he just wants to know what's in that product. "I guess it's better to err on the side of consumers making informed choices on what they're buying," said another shopper in Montpelier, Claire Lachow, as she loaded bags of groceries into a car, including items labeled as containing GMOs. "The scientific evidence hasn't shown it's really that bad for you, but people should be able to make whatever choices they want to make." Food industry groups did not want to see a patchwork of different state labeling rules, so they welcome the new legislation. "We have always advocated for a national and uniform standard," said Erin Sigrist of the Vermont Retail and Grocers Association. "So if this is going to begin the conversation toward a national and uniform standard, we're certainly in support of moving forward." People who want to see clear labels are now urging the president to veto the bill. Many tweeted the White House Friday to encourage a veto. "This struggle will go on," Stander predicted.